Loading logs is one of the jobs in the woods that in years past has required a large amount of skill and physical ability. It is hard work, active work and brains are required. Logs are picked so that they will ride on the trucks safely from the landing to the mill. They are chosen so they will bring the load of logs up to the proper weight and still not exceed the legal weight limit. Not many years ago the loading crew consisted of the head loader and one or more second loaders. 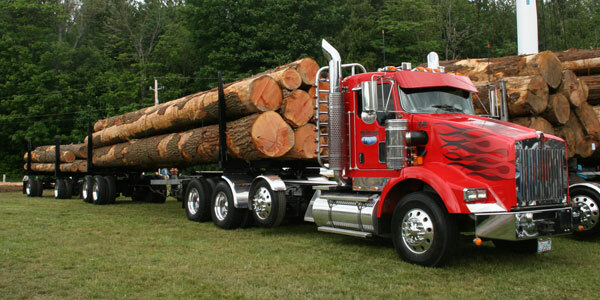 Logs must be picked so that they will fill the bunks of the trucks, or railroad cars, and not hang out in the highway. On many landings in this modern age of logging, logs are loaded with a shovel machine equipped with log grapples. So the skilled job of the head loader has in many cases been merged into the job requiring yet more skill and dexterity, that of the combination operator and head loader. One thing that helps make the job a bit simpler is the addition of the high stakes to the log bunks.Loading logs is an art, one of the creative arts and only a select few have the gifts to handle the job properly. Compared to the Best Load of Log Event the difference is these trucks have two loads on two trailers. Each load is judged separately, then the points for each load are totaled for an overall “Best Load of Logs Double.